Kangaroos are members of the zoological family macropodidae or "macropods". The word macropod is derived from Ancient Greek language meaning "long foot". 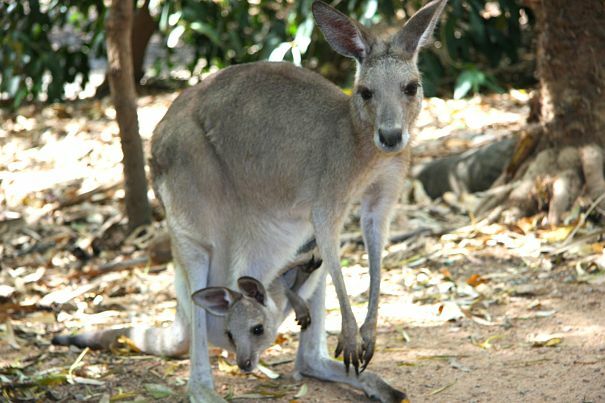 The family also includes the wallaby and the wallaroo, but the term "kangaroo" generally refers to three species of large Australian macropods within the genus macropus, the red kangaroo, and the Eastern and Western grey kangaroos. Kangaroos live in groups of 5 to 40 individuals called "mobs". They can be found throughout much of Australia, particularly the arid interior grasslands commonly called the "outback". The most stunning distinguishing feature of the kangaroo is the overall skeletal uniqueness of these animals. They are bi-pedal animals but they can't walk. The hind legs are designed to move together, and the kangaroo gets from place to place by hopping or bouncing. It is unclear how this form of locomotion evolved, but it is highly successful and efficient, taking kangaroos on long journeys as they search for grass and water in a dry and difficult habitat. Along with its spectacular form of motion, the female kangaroo has a very large forward facing pouch where its young eat, sleep and live for the first six to eight months of life. The baby kangaroo, called a joey, can be remarkably large by the time it stops using the pouch, and can be seen diving in head first, feet, ears or tail dangling out while it nurses or naps. The kangaroo is native only to Australia, and is used, along with the large flightless bird called the emu, on the Australian coat of arms. Kangaroos are not endangered and have healthy populations throughout their range. The kangaroo is hunted in Australia in harvests similar to deer hunting season in other countries, but the practice is under heavy scrutiny and criticism by some groups. Kangaroo meat and fur are a natural part of the culture of many Australians. Kangaroos are herbivores that spend the cooler parts of the day foraging for grasses and numerous species of plants. The midday finds mobs of kangaroos seeking refuge from the sun, often digging out shallow napping holes in the clay to beat the heat. Kangaroos are well adapted to life in arid conditions and have similar physical adaptions to animals like the camel. They can regulate their blood chemistry to adapt in times of drought, and will even become infertile for entire seasons if the body is depleted of water. Because of this adaption, kangaroo populations in the wild vary greatly depending upon the amount of rainfall in past years. Kangaroos have good vision and excellent hearing, and when a member of the "mob" spots danger they will warn the others by thumping the ground with their huge feet. They have a superior sense of smell as well, detecting watering holes from miles away. In the outback, where water is scarce, groups of up to 1,000 kangaroos may converge on a watering source at one time. The kangaroo is a large animal with some adult males reaching over 6 feet tall and weighing 200 pounds, but dingos can still pose a threat, and kangaroos, amazingly, have been observed making a getaway by diving in a river or lake and swimming to safety. The hind legs, which don't move independently on land, move separately when swimming! 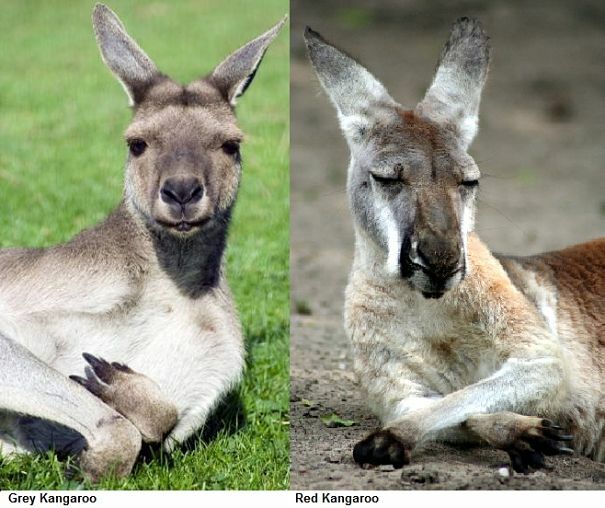 what is the difference between red kangaroos and grey kangaroos? The most recognizable kangaroos are also the largest, most populous and least endangered. The red kangaroo is the largest marsupial on Earth. Males can be enormous at over 6 feet tall and 200 pounds. These are muscular and robust animals that can move at speeds of over 35 miles an hour, gobbling up land with 25 foot leaps. Red kangaroos are not always red, however. Males tend to have rusty colored fur, even when immature, and females are usually blue- grey or brown in color, but there are grey males and red females as well. So the red kangaroo can't be distinguished by fur color alone. Red kangaroos have narrow eyes and distinctive white or pale colored stripes down their cheeks, and black dashes at the corners of the mouth. 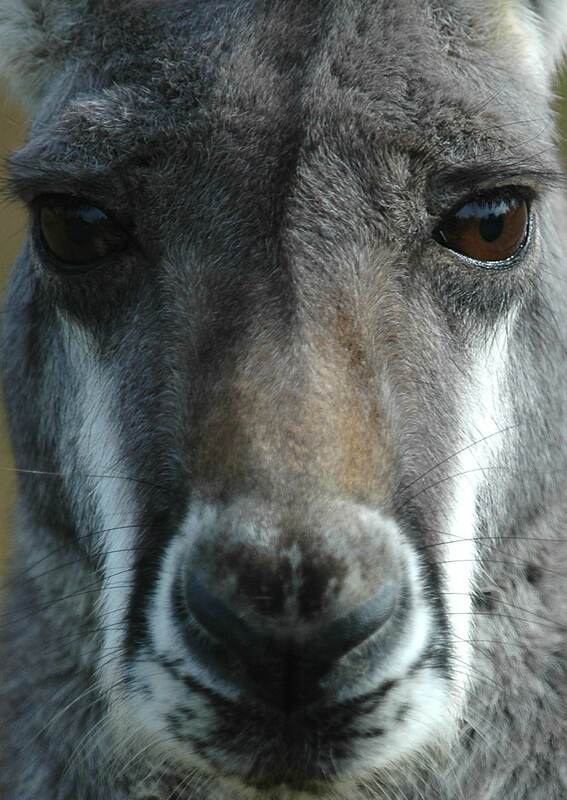 The Eastern and Western grey kangaroos look very similar and were once considered the same species. They are generally not as tall as the red kangaroo but still quite large, and Eastern grey males can actually weigh more than red males. The Western grey has the distinction of being known as "the "stinker". They have a strong odor caused by the types of plants they eat. 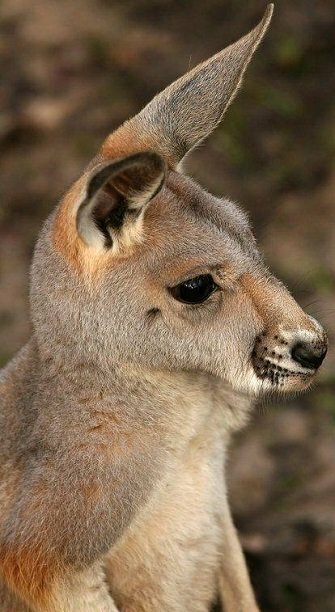 what is the difference between a kangaroo, a wallaby and a wallaroo? Within the family of macropods are dozens of smaller species of very "kangaroo-like" animals. The wallaby is any number of about 30 species of macropds that are much smaller than the kangaroos, and may be as small as 10 pounds. Walaroos are three species of macropod that are slightly smaller, overall, than the smallest kangaroos, but larger than most of the wallabies. Lifestyles and physiology of all of these species is fairly similar. All are land-dwelling grazers that live in social groups. 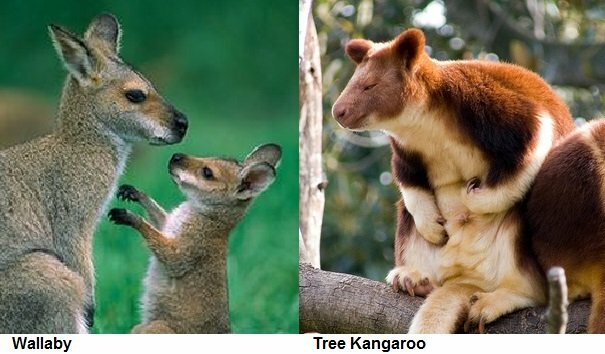 The tree kangaroo is in its own genus and is quite different from the true kangaroos. Tree kangaroos are small, tree-dwelling, nocturnal marsupials. Their front limbs are closer in length and development to the hind legs. The hind legs have smaller, wider feet than kangaroos, with large curved claws to assist in climbing, but the tree kangaroo still hops when on the ground. Tree kangaroos have several subspecies that live in the rain forests of New Guinea and North Eastern Australia. Many species of wallaby and all of the tree kangaroo species are critically endangered. Kangaroos live in large, social groups called "mobs". In some regions these groups come in two forms. One type of group will be a dominant male with several females, and the other will be groups of bachelor males. In some other kangaroo societies, the structure is less defined. Multiple individuals of both sexes will live together and males will court females as they come into season, fighting or "boxing" with other males for mating rights. Males may have multiple partners, but females are usually only receptive for a few days and will reject other suitors once they have mated. If the mating is successful, the pregnancy will last approximately 35 days, with slight variations between the species for the majority of these time frames. 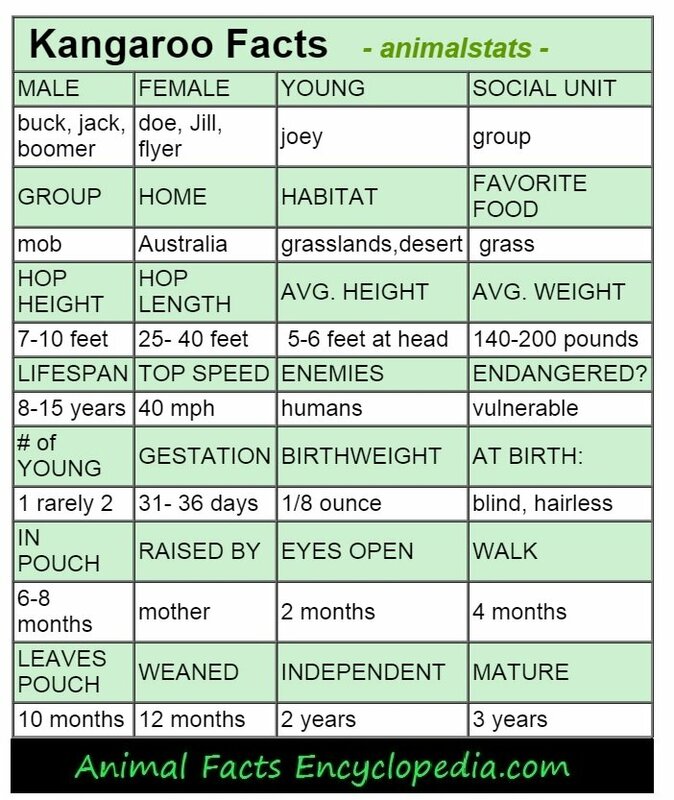 The newborn kangaroo is called a "neonate", because it is not fully formed, and can't survive outside of the womb. It must immediately make its way to the mothers pouch, which, in large red kangaroos, can be a perilous 15 inch trek trough a forest of the mothers belly fur. The neonate is blind, earless and hairless. Only three functions of its body are operational, its sense of smell, its strong front legs and claws, and its instinct to find the pouch. The neonate thrusts forward with no assistance from its mother, dragging its tiny body - only about the size of a jellybean- to the pouch. Once inside, it attaches to one of four teats. The teat swells when stimulated and the baby is practically locked in place by a mouth full of mothers milk. The mothers reproductive system is triggered by the neonate attaching to the teat, and within just a few days of giving birth she will come into season again. If she is impregnated, the new embryo in the womb will grow for the first week and then become dormant, allowing the mothers body to continue to provide for the joey in the pouch. This process is known as embryonic diapause. The development of the embryo is delayed until the older sibling leaves the pouch, usually at about 7 or 8 months old. At this stage a joey is considered to be "at foot", no longer living in the pouch, but still nursing occasionally. The mother will give birth to another neonate while she still has a baby at foot. In fact, if the female breeds successfully each time she comes into estrus, she will occasionally be caring for three offspring at once- a neonate and a joey in the pouch, and an older joey "at foot", ready to be weaned. In the outback, groups of bachelor male kangaroos spend hours a day competing in mock battles, waiting and training for the chance to overturn an alpha male. Male kangaroos have strong backs and shoulders, and although their forelimbs are much smaller than their hind limbs, they are powerful and equipped with sharp claws. 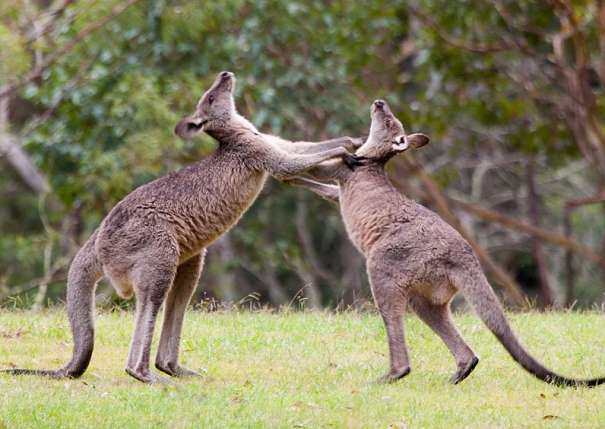 Kangaroos "box" by swatting each other in the face and chest, but also spend allot of time clinching. They will wrestle each other attempting to push each other backwards, which usually results in the fallen individual retreating. In more serious fights, kangaroos will kick out with both legs at the same time, using their tails to support them as they extend their powerful clawed hind feet towards their rivals. 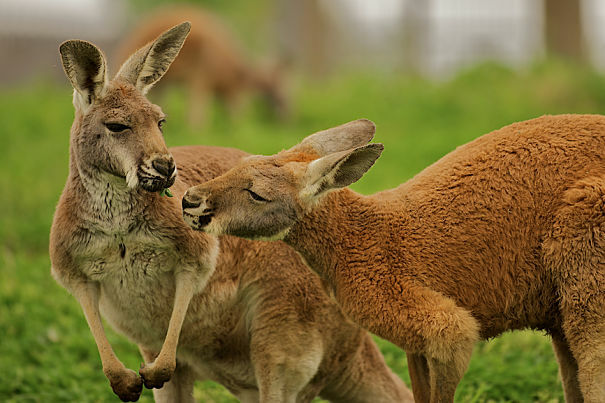 Although these fights look dangerous, kangaroos rarely injure each other. Much of the kangaroo boxing match seems to be more ritual than real attempts to do harm. The "loser" can retreat and is rarely pursued. Naturally, human beings found a way to exploit some of the tendencies of male kangaroos by creating side shows and circus acts with "boxing" kangaroos. Usually a volunteer from the audience was involved, and sometimes these competitions involved prize money. Animals in this position were probably under enormous stress, feeling threatened and forced to defend themselves constantly, but many of the hapless human "volunteers" got off even worse. 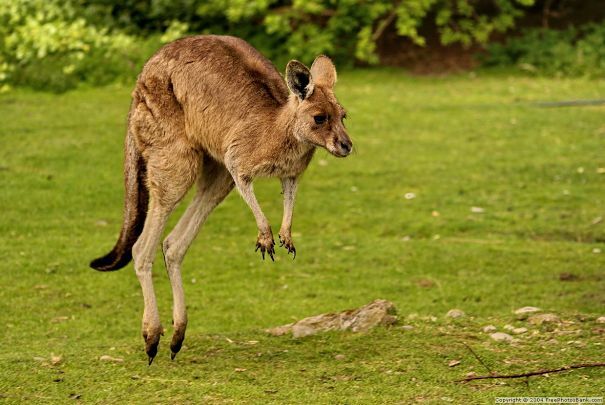 Kangaroo locomotion is all about hopping. The kangaroo is effectively a bi-pedal animal, standing on its two large hind feet the majority of the time. It has small forelimbs and relatively dexterous front paws with five digits. The thumb is not opposable. Kangaroos can grasp things with their front paws but they don't do this often, only occasionally grabbing branches or grasses. Although kangaroos stand upright they can't walk on their hind legs because the legs can't move independently. The tail is so large and powerful that it acts as a third (or fifth) limb and makes the kangaroo almost more tri-pedal than bi-pedal. The tibia bone of the hind leg (shin bone) is twice as long as the femur (thigh bone) and creates a sort of "z" shape to the hind legs which act like two giant springs, capable of propelling the kangaroo up to 30 feet in a single bound. This unusual form of locomotion is called saltation. The legs have no knee caps, and the tibia bone has pads of shock-absorbing fibrous cartilage unique to the kangaroo. The muscular tail is as long as the entire body, and is used as a massive rudder when hopping. The tail is capable of easily supporting all of the kangaroos weight. Kangaroos can rock back on their tails and deliver powerful kicks with both legs at the same time. The hind legs only move separately when the kangaroo is reclining, stretching or swimming. When it is in motion on land, the legs always move in tandem. When moving at full speed, the forelegs are held in front of the chest and the hind legs do all the work. When grazing and foraging the kangaroo moves by by supporting its weight in a tri-pod of the two front paws and the tail and then lifting the hind feet together and swinging them forward in a shuffling gate. This is sometimes referred to as walking on "all fives".